When you have already seen an artist performance once at their peak, would you expect, that it can get even better? Well, probably, if you know you are going to see Joe Bonamassa. The impressive Royal location of Hampton Court Palace couldn't have been a more suitable place to watch a sold-out festival with the guitar titan of Blues Rock. He opened the show with the powerful grooves of two new songs, 'King Bee Shakedown' and 'Evil Mama', both from his forthcoming studio album. The second song especially represented his recognisable, dirty Blues riffs á la Gary Moore that were perfectly accompanied by his eight-piece band – Reese Wynans on keys, Anton Fig on drums, Michael Rhodes on bass, Lee Thornburg on trumpet, Paulie Cerra on sax and his backing singers Jade MacRae and Juanita Tippins; all world class and renowned musicians who surely have contributed to Bonamassa's titanic success. The third song was another well-written and performed song from his upcoming album entitled 'Just Cause You Can, Doesn't Mean You Should', which had an unexpected and uplifting change in the middle eight part with great brass sections in it and some punchy bass. One of the most emotional and intimate moments during the concert was followed up by the captivating song 'Self Inflicted Wounds'. The title says it all; the beginning of the song sounded like a blend of 'Purple Rain' and a Quentin Tarantino movie soundtrack, with relatable lyrics that moved the listeners due to an incredible soulful interpretation and an ending that was a show on its own. This song had it all, the theatric and huge sound of that hymn ended with a stunning solo performance from his backing vocalists which flowed into a massive reverb and made everyone in the audience speechless. All four of the new songs from his forthcoming studio album had huge "banger" potential and they immediately made you inpatient to wait until autumn for the release. Bonamassa proved that he can play all kinds of Blues. With 'Some Other Day', he gave everyone a glance of a great performance of Louisiana Blues, whilst 'No Good Place For The Lonely' brought back his individual creation of powerful Blues/Rock. Everyone who knew that song was just waiting for the big build-up of the track that lead into a drop down where you first thought the song was at the end, but then that heroic solo of Bonamassa's kicked in and reflected his influences of B.B. King and Chuck Berry perfectly. Next the band started to play his power ballad 'How Deep This River Runs'. With stunning harmonies from his two beautiful backing vocalists and a crunchy and strong guitar solo that mixed with a deluxe light show, this song truly got deep under your skin. It was then time to get funky. Of course, there is no music style that Bonamassa can't play. He introduced a friend on stage who accompanied him greatly on guitar. If you thought you have seen all kinds of solos already, then this one topped them all. It started with a sparkling trumpet and sax solo, followed by an amazing call and response playing of Bonamassa and his friend. Both showed all kinds of variations; they made their guitar sound like a violin before they added some big crunch to it, they then repeated the exact same thing, but in reverse and what the other one had played first. Not only great to hear, you could see the band were truly having fun on stage. The band introduction that followed confirmed how long the group had already known each other and how well they worked together. When you have people in your band who have already worked with Steve Ray Vaughn, Bob Dylan, Jonny Cash, Stevie Nicks, just to mention a few, then you can imagine how high the level of this performance was. Bonamassa never talked a lot in between the songs, but he simply didn't need to... it was all said with the music. However, it was truly sympathetic to see his sense of humour during the band introduction where he funnily introduced the slogan of the band: "We play too many notes too loud, but we don't care, 'cause we love it!" He finished the show with the song 'Last Kiss' and got called back on stage with a big and long-lasting round of applause from the audience, which he then rewarded with 'Slow Gin' as an encore. Bonamassa has proven once again why he is called the "Titan Of Blues Rock". He not only provided a high-class and perfect performance, he was also able to convert all kinds of Blues styles from different guitar legends into the powerful and timeless songs where each one has a big hit potential. 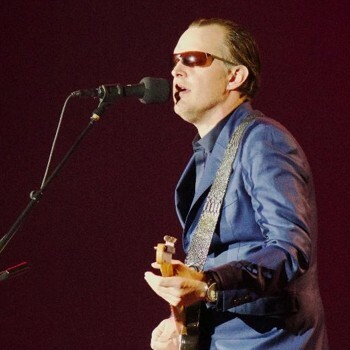 Just like King Henry VIII once ruled Hampton Court Palace, Joe Bonamassa ruled the stage and clearly earned his title – 'The Titan Of Blues Rock".